If you have a child under the age of 12, or if you've left your house in the past few weeks, then you already know about silly bandz, aka animal bandz, aka crazy bandz. For the other two of you, they're rubber bracelets that retain their different shapes (and there are hundreds of them) when you untwist them. Kids are crazy for them. Schools are banning them. They make gibbets and Japanese erasers feel as modern as corsets and cotton gins. Clearly this eight-year-old blogger was no dummy, because she got 350,000 hits last month writing about nothing else but these bracelets. 350,000? Eight years old? 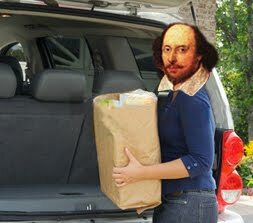 Come on, people, we cannot let ourselves get trounced by a gimmick-hawking tween whose parents are obviously trying to pad her resume so she can get into the Ivy League: spread the word about everydayshakespeare! This has gotten me thinking that we need to make our own Shakespeare-shaped bandz. I think Will would approve of becoming an affordable fashion fad, don't you?